Wisdom teeth are also known as third molars. They are the last teeth in the arch of a patient’s mouth. These teeth begin their formation roughly around the age of 12 and begin to erupt into the oral cavity/mouth as early as 15 but can continue up to the age of 25. Some theories have suggested that with evolution, the jaw size (arch length) has diminished, not allowing space for the wisdom tooth. Thus, it requires early intervention and removal of teeth before causing injury. Without this oral surgery procedure, the decrease in arch size, which causes impacted wisdom teeth, can lead to problems in the future such as infection, damage to adjacent teeth with caries/root resorption and possible cyst formation. Removal of wisdom teeth does not have to be a frightening process. Torrance Oral Surgery and Dental Implant Center provides IV/general anesthesia to allow for patients to experience relaxing and comfortable procedures. 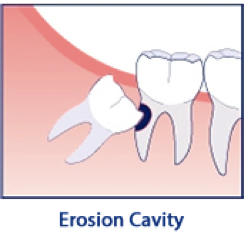 Soft tissue impaction: The wisdom tooth has penetrated the bone, but it is partially or fully covered by the gums. This partial penetration allows for food debris to be collected between the gums and tooth, causing infection. Complete bony impaction: The tooth is 75 – 100 % surrounded by bone. The type of impaction can determine what type of oral surgery is needed for removal. Dr. Benjamin Yagoubian has extensive experience and training removing impacted wisdom teeth to relieve discomfort and protect the oral health of our patients. If live in Torrance, Carson, Redondo Beach, San Pedro or the surrounding communities and you or your teenager have wisdom teeth that need to be removed, you can trust our caring and experienced oral surgery team at Torrance Oral Surgery and Dental Implant Center. Contact our office to schedule an exam and consultation with Dr. Yagoubian to learn more about this procedure.